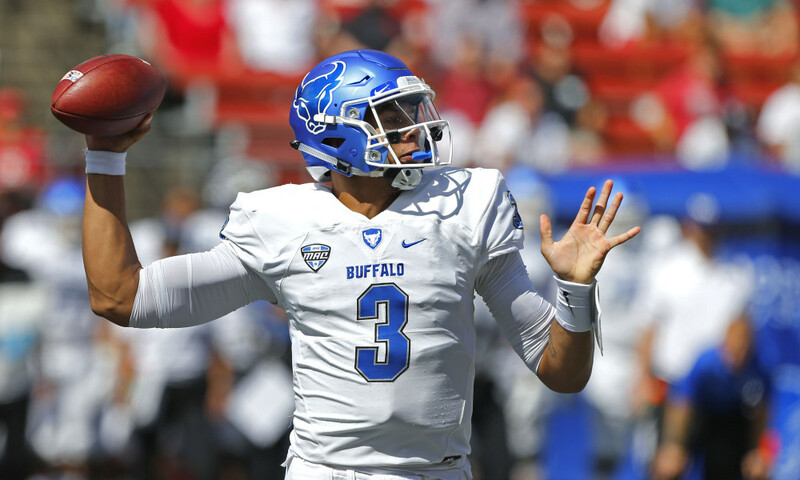 BUFFALO, NY – Former University at Buffalo football players Tyree Jackson and Anthony Johnson have earned invitations to the NFL Scouting Combine, the National Football League announced on Thursday. It marks the first time in school history Buffalo has had two players invited to the Combine in the same year. The busy offseason continues for the pair. Both Jackson and Johnson played in the Senior Bowl and competed in the State Farm All-Star Football Challenge in January. Jackson was the South team MVP at the Senior Bowl. Jackson is one of 17 quarterbacks scheduled to participate and one of only three from a non-Power 5 school. The 2018 Mid-American Conference Offensive Player of the Year threw for 3,131 yards and 28 touchdowns in 2018. His 28 touchdowns were second in school history for a single season and his 35 combined passing and rushing touchdowns were the most in program history for a single season. Johnson is one of 48 wide receivers scheduled to participate. He had another stellar season for the Bulls, leading the team with 57 receptions for 1,011 yards and 11 touchdowns in 2018. In only 25 career games, Johnson finished his career ranked fourth in school history in career receiving yards with 2,367 and third in career touchdowns with 25. He was a two-time first-team All-MAC selection. The week-long showcase is set to begin on February 26 and run through March 4 at Lucas Oil Stadium in Indianapolis. Quarterbacks and wide receivers are scheduled to work out on Saturday, March 2. The NFL Scouting Combine will air on the NFL Network throughout the week.